. Kanda 神田 district of Edo . 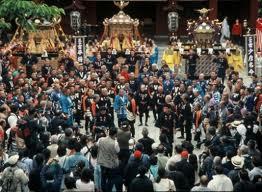 The Kanda festival takes place once every two years in May. The Shintoism parade, called the Shinko-sai, features portable shrines (Mikoshi), festival floats (Dashi), big baby dolls, and many child dancers. Several thousand people take part and there are more than 70 shrines in the parade. The main building of Kanda Myojin was built in 1934 after which the building was left exposed to the elements for 67 years. Typhoons, air pollution, and the bombs of World War II caused great damage to the shrine over the years. A scientific study concluded that immediate repair work would prevent further damage thus conserving the building while restoring its original beauty. The managers of the shrine are making every effort to preserve this beautiful artifact of Japanese culture. Jan. 8: "Kagura-hajime" at the sanctuary of Kanda Myojin Shrine in Chiyoda Ward. Shinto dance and music, accompanied by drums, flutes and other instruments, will be performed from 2 p.m. Kagura is the sacred dance offered to the deities. is a Shinto shrine located in Chiyoda, Tokyo, Japan. The shrine dates back 1,270 years, but the current structure was rebuilt several times due to fire and earthquakes. It is situated in one of the most expensive estate areas of Tokyo. Kanda Shrine was an important shrine to both the warrior class and citizens of Japan, especially during the Edo period, when shogun Tokugawa Ieyasu paid his respects at Kanda Shrine. The three major kami enshrined are Daikokuten, Ebisu, and Taira no Masakado. The head of Masakado, with its arrow still sticking in it, fell down in Kanda and stayed there for seven days before it died, with its eyes open all the time. Now the shrine is a protector deity of archery.
. Kaeru カエル　蛙　Frog Amulet - Frosch .
. Netsuke with a rabbit 根付お守り . Kanda is home to the Kanda Myojin shrine, devoted to Taira no Masakado , who led arebellion against the central government during the Heian period. 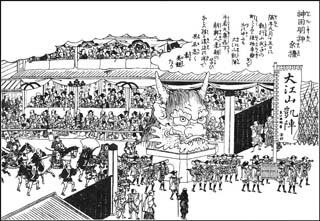 In the Edo period, the shrine's festival was one of the three most famous in the city. A popular Japanese television series, Zenigata Heiji, features a fictitious police patrolman (the title character) whose beat is Kanda. Near the end of every show, Heiji fells the dastardly villain by throwing a coin at him. ZENI means coin. This series was one of my favorites and Hashizo Okawa played the part of the serious Heiji very well. If England had Sherlock Holmes then Japan's answer is Zenigata Heiji. 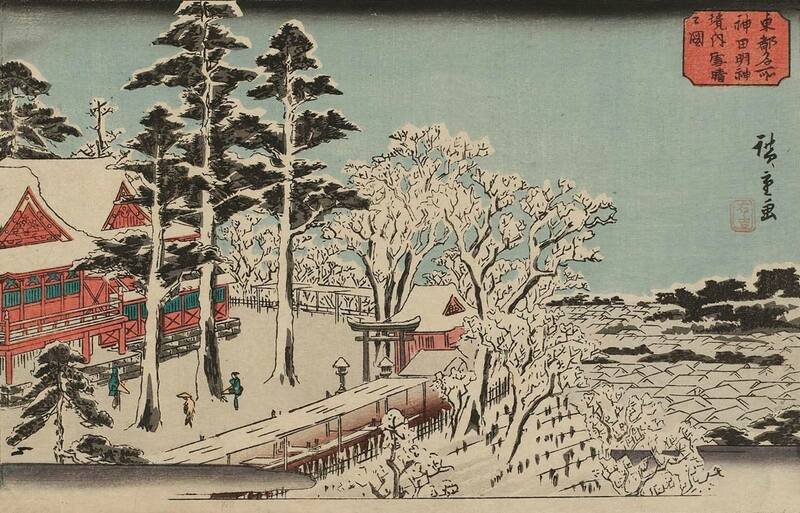 His partner was the comical Hachigoro, a devote but rather inimaginative downtown lad. When Heiji left his home for work, his wife Shizu would take out the flintstone from the Shinto home altar and produce some sparks over his shoulders, to wish him good luck. is worth his own story. 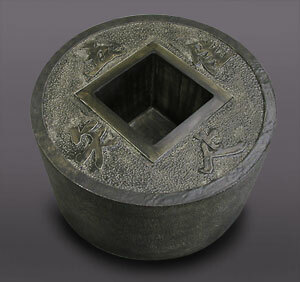 He was beheaded and his head seems to have taken on a life of its own in his "head mound" kubizuka. Here just a few notes about him. ... ... ... ... ... But now, learn why　Zenigata. 。。。。。。　"ware tada shiru taru"
I alone know I am content with things. "If you learn to be contend, you are rich in spirit!" For some reason, this inscription is often found on stone basins (zenigata-tuskubai 銭型蹲つくばい) in a tea garden. Maybe to remind the guests of this saying, since a tea ceremony is also something austere, solemn and simple (never mind the hidden luxury). The Town Kannon-Ji in Shikoku 観音寺 琴弾公園 makes its appeal with a pattern of this coin carved in the sand of the dunes close to the beach. 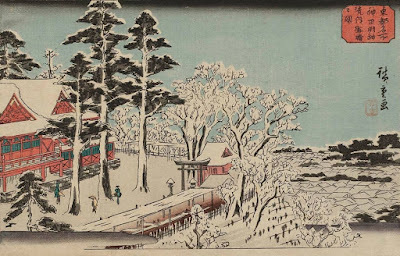 It is said its origin is in the year KANEI, when the fishermen dug this pattern to please the feudal lord of the area on his visit. But there are other explanations too. This pattern is completed every year, usually after the typhoon season it has to be re-structured but is a great tourist attraction these days. Whoever looks at this pattern of the old coin will never be in want of money! I wonder if a look at it via your screen, just like now, will also work the magic. your blood type is "B"
. Hoshinaga Fumio 星永文夫 . "Blood-type B is rare in Japan; Type A is happier, but Type B carries a sense of melancholy. So, I felt my rebelliousness or revulsion could not be Type A – it must be blood-type B." Ketsuekigata wa nan desu ka? My blood tpye is ZENIGATA !
. 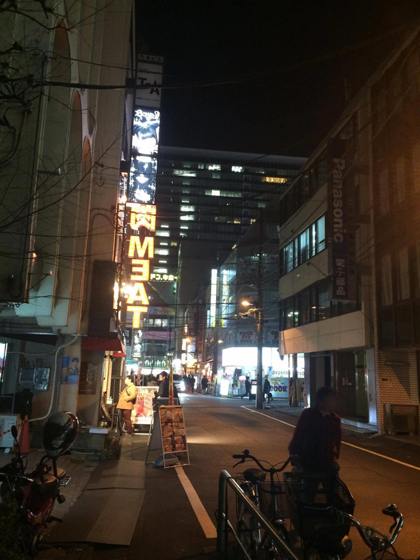 神田 Kanda district of Edo . Before the great fire of Meireki （1657） the temple 東本願寺 Higashi-Hongan-Ji was located here. The naka yashiki 賀金沢藩前田家中屋敷 middle estate of the Maeda Lord of the Kaga domain was located here in 1684. 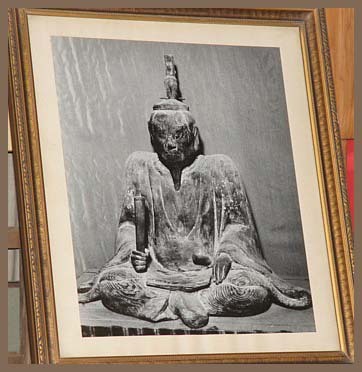 In his honor it was named after the town of Kanazawa in Ishikawa prefecture. Part of the road was called 明石長屋 Akaishi Nagaya, named after 明石屋吉右衛門 Akaishiya Kichiemon. The name was lost in 1964, when it became part of Soto Kanda.
. Kanazawa 金沢. Ishikawa 石川県 . Kanda was the district where most of the craftsmen lived during the time of Tokugawa Ieyasu.
. shokunin　職人 craftsman, craftsmen, artisans . I do love these glimpses into Japan and Japanese Culture that you give us here, Gabi. Thank you so much for sharing this. I am glad you enjoy it! shinden 神田 "divine rice field"
iwaida　祝田 "field for celebrations"
nukihoden, nukihoda 抜穂田 "field to pull out ripe rice ears"